On 26th June the University Tropical Biodiversity glasshouse hosted a visit of 90 pupils from Aldryngton Primary School. 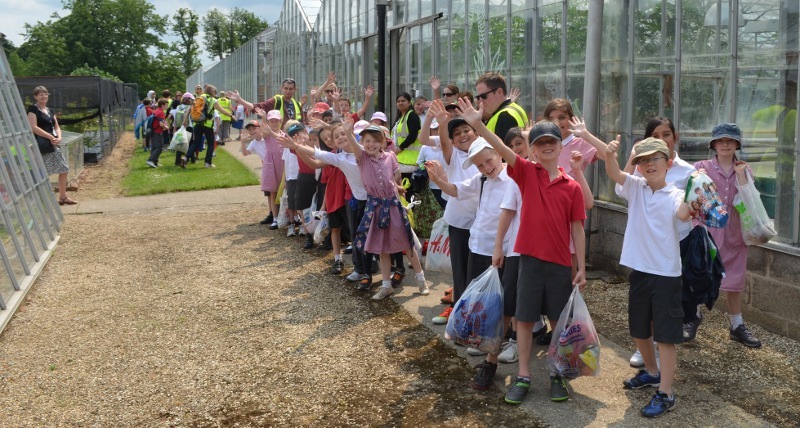 This was the first official school visit we have hosted since the refurbishment of the glasshouse. Mrs Dunn from Aldryngton was the main school organiser. Ann Westgarth had organised the Health and Safety assessment, helpers to ferry people to the nearest loo and all the other issues that need to be addressed for such a visit. removed the hosepipe used for watering, and potentially a trip hazard for small children. I had prepared some simple plant labels to point out species that might be particularly interesting. Even the sun was shining! The three classes arrived together with teachers and numerous helpers and then split into three groups, one outside, one looking at the carnivorous plans and one visiting the tropical biodiversity greenhouse. 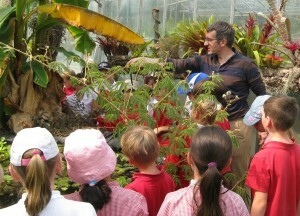 We couldn’t possibly house all 90+ pupils and their helpers in the tropical glasshouse in one go! Aldryngton pupils getting their safety introduction. Once in the greenhouse we started with a brief announcement of which plants might be dangerous to handle – some leaves have sharp edges, some have spines, and the hot chilli… is very hot! The pond also has it’s risks as it is about 90cm deep in places, but, because it is raised up, is quite difficult to fall in to. 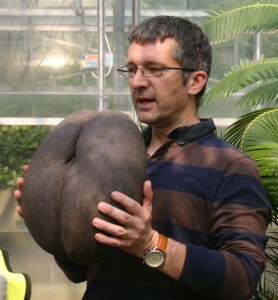 Once the safety basics were dealt with it was time to introduce some of the plants on display. Of particular note on the pond is the clump of Papyrus, a plant used by ancient Egyptians as a writing material. Papyrus manuscripts have survived from 4500BCE in the dry climates of the middle east. 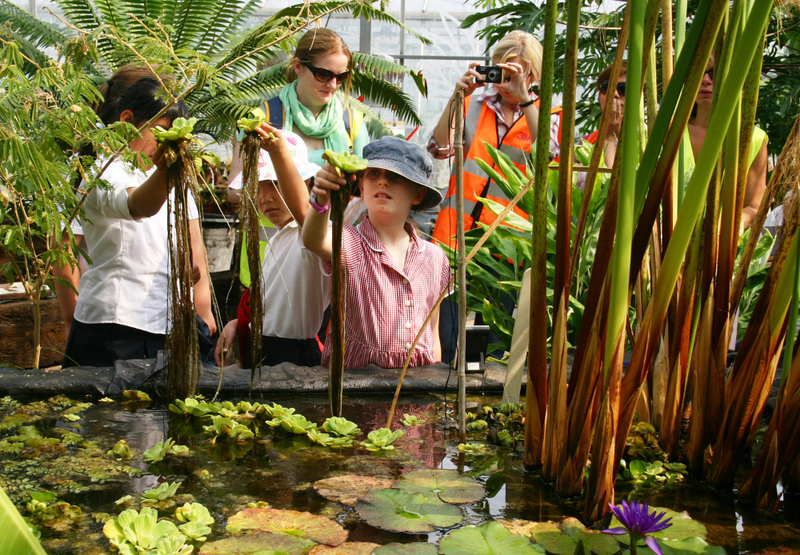 Aldryngton pupils looking at the long purple-black roots of water hyacinth. The three floating water plants: Water Hyacinth (Eichhornia crassipes), Water Lettuce (Pistia stratiotes, actually in the Arum Family). and Giant Salvinia (Salvinia herzogii, one of a group of four species known as Giant Salvinia), form floating mats on the pond surface and each is an invasive species in some parts of the world. These three plants all have adaptions to allow them to float back to the surface if submerged. The first two also have very long roots that mop up any nutrients from the water while the third has no true roots at all, just leaves that look like short bunches of roots on a stalk. 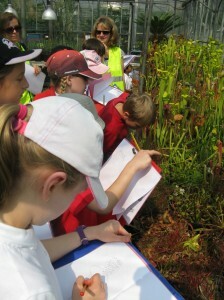 Aldryngton pupils checking the root length on Water Lettuce, watched closely by teachers and helpers. 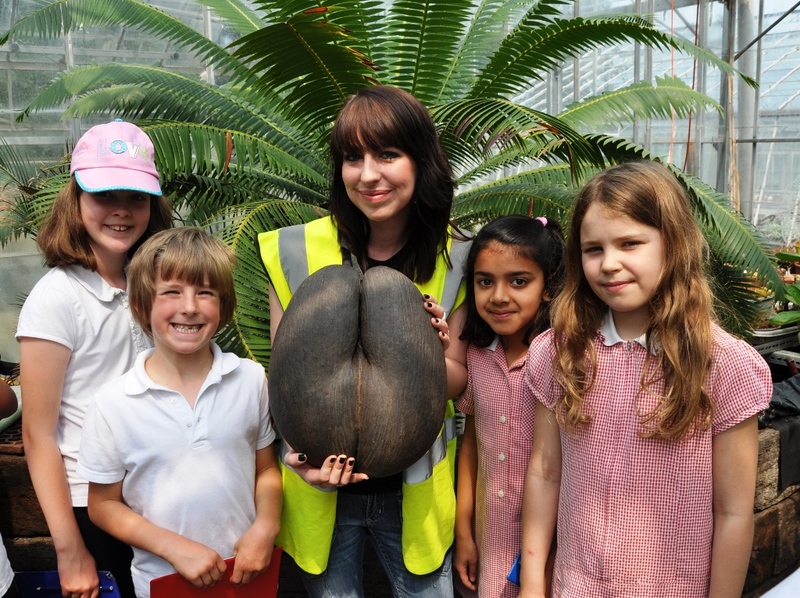 Pupils in the Tropical glasshouse were using plants to help learn world geography – which plants are found in which continents. This was made easier by the geographically themed plantings for Africa, Asia/Australia, and the Americas. The crops, pond and low nutrient areas are not geographically themed but themed to growing conditions. From Africa we had ‘Guinea Grains’ (Aframomum melegueta) which has a beautiful rich somewhat gingery, somewhat cinnamon smell to its leaves, from Asia the Pink Banana (Musa dasycarpa) and from the Americas the misleadingly called ‘Spanish Moss’ (It’s not Spanish and not a moss), Tillandsia usneoides. As well as the plants growing in the greenhouse I brought one of the Herbarium’s double coconuts (Lodoicea maldivica) to discuss the issues of rarity and because it’s the world’s largest seed. This was one of the most sketched items among the children and a cause of much interest and discussion among the helpers and teachers. Sugar cane is sweet, if somewhat fibrous, and is commonly sold in cane growing areas as bundles of short stem sections. 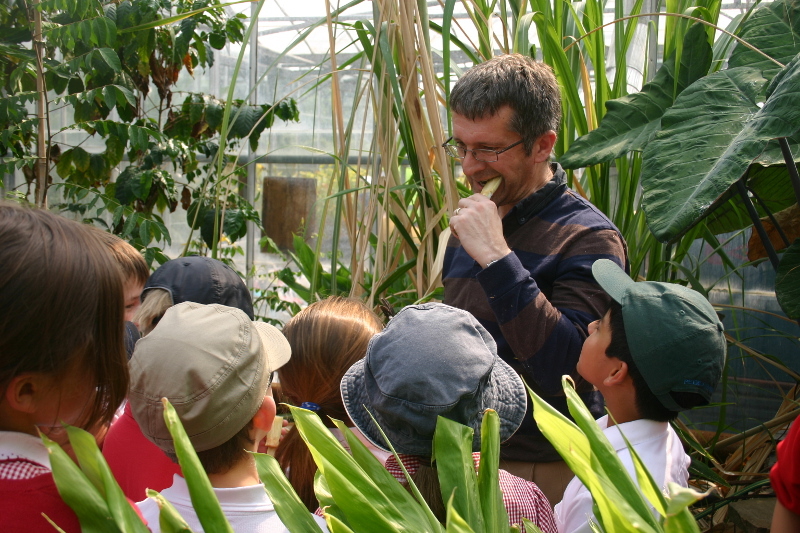 Touch and smell are very important senses so pupils were encouraged to feel the surface of plants – some waxy, some furry, some rough, and to smell the plants, especially the Lemon Grass (Cymbopogon citratus) and the Guinea Grains. Our careful use of biological control and absence of pesticides in the greenhouse means the plants have no risk of containing residues of unsuitable chemicals. Finally I cut some sugar cane into small strips to give everyone a chance of discovering the taste of freshly grown sugar. This was very popular! The pupils and their minders seemed to enjoy the visit very much. The thank you letters were very welcome and I had great fun identifying the plants they had drawn! The school reported the visit on their web site and in their newsletter. Saying goodbye after the visit. 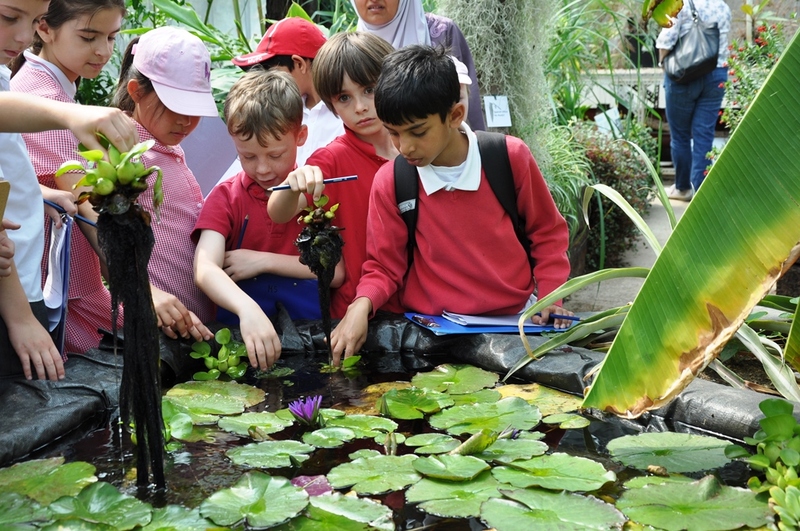 This entry was posted in Annual Fund, Countries, Hands-on, People, Primary Schools, School Visits and tagged Aldryngton Primary School, Eichhornia crassipes, Musaceae, Water Lettuce. Bookmark the permalink.